A SENIOR policeman sagged, weeping, into my arms as the lone jet broke from the fighter formation above Mandela’s grave. For a moment echoed in dozens of hugging or silent groups on a cow field opposite Mandela’s state funeral in Qunu, this muscle-bound policeman forgot the rules about talking to the media and called me “brother”, and I – weeping in turn – forgot journalistic rules, and held on to him. And in a last minute moment of reconciliation, Archbishop Desmond Tutu was welcomed to the event by ANC members of the funeral committee, after he had been excluded from the guest list and appeared to have been snubbed. On Saturday night, Collins Chabane, minister in the Presidency, backed the government out of a potential image disaster by pointedly announcing that all VIPs from the FNB stadium memorial event – which included Tutu - would be “welcome” to the funeral. Regal in black silk head dresses, Mandela’s widow, Graca Machel, was stoic and occasionally tearful, while Winnie Mandela appeared relaxed; chuckling at stories told by his granddaughter Nandi Mandela about Madiba’ early battles with pride and western etiquette. Despite over-formal and repetitive protocol greetings from the speakers – and reports of both profiteering and crowd no-shows at some public viewing events - Mandela received a soaring and largely smooth send-off. 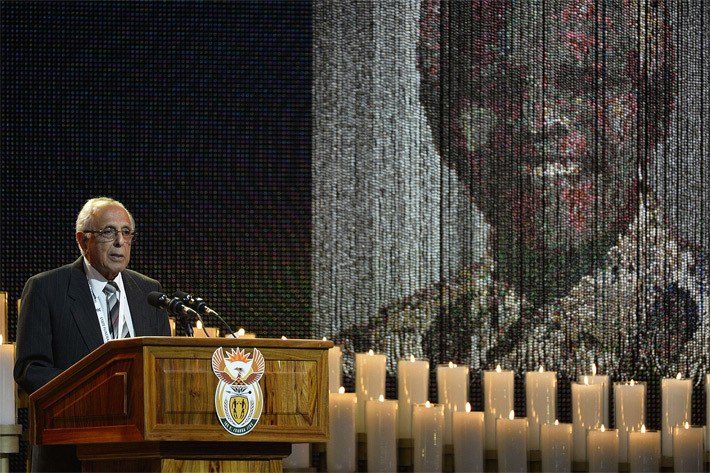 President Jacob Zuma won praise even from some critics for turning his eulogy into a public vow to recommit the entire government to achieving Mandela’s goals for greater opportunity, accountability and equality. “South Africa will continue to rise . . .we will strike a decisive blow against persistent poverty, unemployment and inequality, and become a global force for social and economic leadership (because) we dare not fail you,” said Zuma. Durban couple Linda Bukhosini and Bongani Tembe – respectively, the CEOs of the Playhouse, and the KwaZulu-Natal Philharmonic – were chosen as the soloist singers for the event, and told The Witness they had been “supremely honoured” to have performed for Mandela five times in life as well. But Bantu Holomisa’s claim from the podium – that Mandela was “even now” achieving greater unity for South Africans than “at any point in history” appeared to true outside the purple and gold grandeur of the funeral marquee, at least among nearby mourners. In the field opposite the white funeral pavilion – where friends like Oprah Winfrey and Richard Branson mixed with family and African leaders - children, police colonels and cattle wandered freely behind Upper Qunu’ tented funeral viewing area, where hundreds kept one eye on the military show at Mandela’s house and the other on a big screen. Even sitting in the shade on the hillside 400 metres away, men removed their caps as the final prayer was said, and again when Mandela’s coffin was lowered into what Bantu Holomisa described to The Witness as “his final house”. There was a scramble to the edge of the hill as three helicopters began the flypast salute – the same hilltop where Mandela once “knocked birds from the sky” with his slingshot, and moulded cattle from clay. A roar of excitement turned into a collective gasp of wonderment as the single Gripen jet which had bolted from its formation into a vertical climb appeared to vanish into a large white cloud; no one from the hill saw it reappear. The moment became almost absurdly perfect as two white birds suddenly flew from the aloes right in front of us, and Mkhwanazi and I chuckled through the tears, and villagers pointed them out to their children. We get separated, but Mkhawanazi later makes a point of stopping his police car next to me to wish me well, and - although the "my brother! "of the earlier emotion has changed to an every-day "my broer"- he offers his personal phone number. And as the massed military convoys and VIP buses leave Mandela’s final resting place, I realize that it’s not so strange after all; that, thanks to the man we saw buried, the policeman and I have already been brothers for 19 years. In his final act, Mandela just reminded us of the fact.